Jacksons Mark Morton DX2 Dominion delivers the Lamb of God guitarists powerfully potent sound and style with remarkable value. 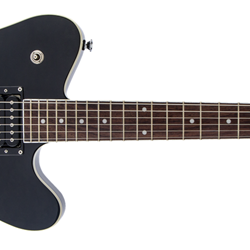 Premium features include beautiful satin black and gloss Trans Black finishes (quilt maple top on Trans Black model), compound-radius (12-16) bound rosewood fingerboard with 22 vintage-style frets, and dual DiMarzio Mark Morton Dominion Signature humbucking pickups with three-way toggle switching. Other features include a 24.75" scale length, one-piece through-body maple neck with graphite reinforcement, distinctive three-on-a-side Jackson Mark Morton Dominion headstock, adjustable chrome bridge with anchored tailpiece, and chrome hardware.